Silanes/Siloxanes vs AQURON 7000 Penetrating Hydrogel Spray applied concrete treatment. AQURON 7000 deeply penetrates and waterproofs the internal concrete matrix, while immobilizing & reducing avaliability of free chlorides to the corrosion process. It is these multiple benefits that set AQURON 7000 apart from other surface treatments. AQURON 7000 mode of action that attracts internal moisture and forms a pore blocking hydrogel has proven successful in directly targeting the cause of the various concrete deterioration forms, that is, the moisture. 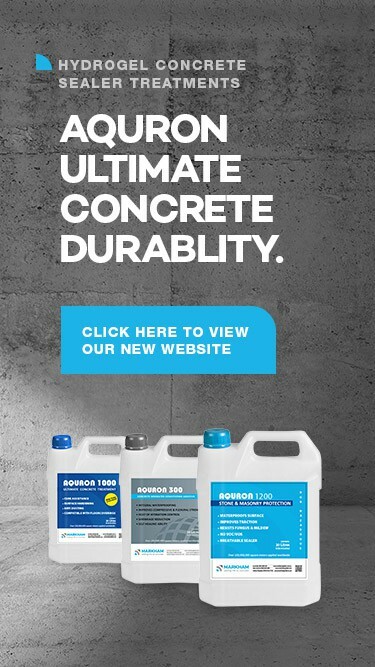 Stop moisture ingress into concrete is globally recognised and proven in reducing deterioration in concrete structures. The permanence of the penetrating hydrogel provides a compelling economic advantage both short and long term. By comparison the surface coatings permanence is fragile. Within the industry engineers/architects appear to be increasingly specifying AQURON 7000 to achieve extended service life on existing concrete structures. This is because other coatings are proving fragile. AQURON 7000 is user friendly to the operators and the environment. This comparative attribute is increasingly important to asset owners particularly government entities. The track record of AQURON over 25 plus years provides permanence confidence to asset owners.